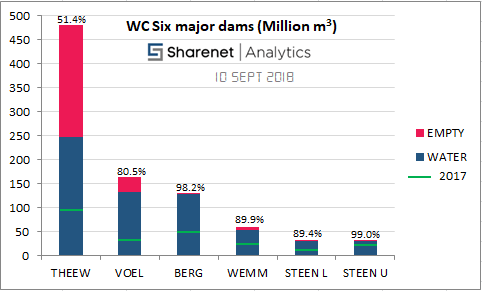 The six major dams feeding Cape Town are just shy of 70% full. As from 1 October, the City has relaxed water restrictions from Level-6B to Level-5, allowing for 75 liters per person. 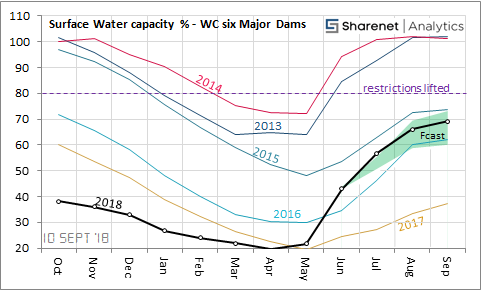 The projection of accumulated water storage is right on target according to our forecast model revealed in June, and if we are blessed with one more weather system we could surpass the levels achieved in 2015 at the end of the hydrological year. The SA economy fell into technical recession, and is now officially the slowest growing economy in the world. A large part of the reason is the 29% collapse in Agriculture in Q2, following the 34% collapse in Q1, due mainly to the drought. However, with these water levels, we will not have to ration agriculture in the Western Cape as dramatically as we did last year which will hopefully provide some much-needed relief.